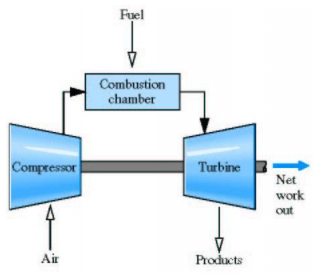 Explain with neat sketch construction and working of constant volume gas turbine. Constant volume gas turbine Working:- Air from surrounding atmosphere is drawn in compressor and is compressed to a pressure of about 3 kN/m2 . The compressed air is then admitted to the combustion chamber through the inlet valve. When inlet valve is closed, the fuel oil is admitted by means of a separate fuel pump into combustion chamber containing compressed air. The mixture (of air and fuel oil) is then ignited by an electric spark, the pressure rising to about 12 kN/m2 , whilst the volume remains constant. Thus combustion takes place at constant volume.